This weekend, aside from generous gifts and good food, I acquired a 1950's era lamp that belonged to my great grandmother. 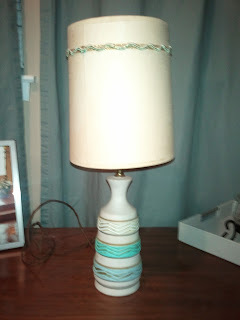 It's an off white with three bands of zig zag stripes in shades of blue with bronze trim. It's pretty fabulous already, but it doesn't go with my house... yet. I want to paint the stripes either a dark silvery gray or dark teal, depending on where I decide to put it, and replace the shade with a more modern one. However, I hesitate because it's a 60 year old lamp that belonged to Maw Maw Zoe. She was a pretty chic lady who wore fox fur collars and skirt suits, and I kinda think she would be glad that I was still using the lamp in my home. On the other hand, she may look down from heaven and go 'what the heck is Haley doing to my stuff?" If she were a hip and ahead of her time lady, I think she'd want you to make the lamp your own. Follow your style!! My grammy would tell me to paint it -- dooo it! =) This way it is snazzed up and fits your decor... and will remind you of her! win win! I bet she would be pretty happy that someone is using it and it wasn't thrown away. Paint it!